Is there a time when it pays to protect your own? Spoiler alert: The views I’m about to express might seem different from the usual way of thinking. Don’t worry. It’s a good thing. I’ll explain why below. 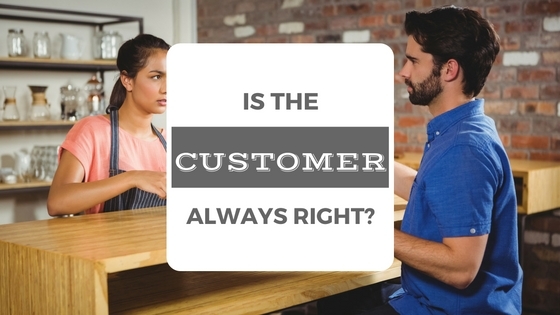 Recently, there have been a lot of articles written and debates waged on the one simple question: Is the customer always right? This seems like a simple question, but it really gets down to the core of your business. For example, when we started Mavidea Technology Group, a customer was anyone who showed an interest in our services and felt there was a value exchange worthy of the price we were charging. Basically, we would take money from anybody. We were younger then and less mature. It was exciting to discover people who were excited to pay for the services we could provide. As you can imagine, we ended up providing services to a wide range of customer types and demographics. Some were a great fit. Some…not so much. We just didn’t have a good understanding of our true customer profile. And this wasn’t the best solution for anybody – our customers or ourselves. I mean this sincerely when I say that at Mavidea, we’ve always felt that the customer is always right. But what we weren’t prepared for was the many varieties of customer we would encounter. And that our employees and our service model could not contort to fit the needs of every size and shape of business. Along the way we discovered (sometimes the hard way) that what was right for something like a multi-location medical practice with 200 employees was very different than what was right for a small landscaping company that services one area and has five employees. That started us on a road that has led us to our current service philosophy – one that’s centered on providing the right service to businesses who we’ve aligned ourselves to serve. We don’t do our customers a service when we sell them solutions that don’t truly help them get what they need to respond to market pressures and grow their businesses. So when I hear the statement, “the customer is always right,” I think of all the ways the ideal of good service can go off the rails. It’s not a question of right or wrong. It’s more a question of truth -- and whether there’s an end result that can mutually benefit both parties. A wise man once told me that if a relationship isn’t mutually beneficial, it doesn’t usually last very long. I think about that a lot and think about how that can be applied to our concept of whether the customer is always right. Ask yourself if you really understand your customer -- what makes them tick. Do you really have a service that aligns with their business? Can you help them address critical situations they face? If you do have a complaint, have you heard this before from other clients? If there is a gap between current customer expectations and what you can provide, it’s time to rethink your approach and make a change. Are you still asking important questions? Often, our client relationships put us in the role of expert. Unfortunately, when we serve in that role long enough, we go in thinking we already know the answer. It’s easy to miss valuable information when we fail to listen and ask good questions. At Mavidea, on the rare occasion a client parts ways with us, we like to conduct a Black Box Conversation. In that conversation, we review situations where we’ve missed the mark. Based on what we hear, we make a specific plan to improve. I encourage you: If you find yourself with a service gap, don’t hesitate. Listen. Think hard about it. And if it makes sense, change it. Don’t ever be too proud to adapt your business to meet the changing needs that you identify from your client base. To help service gaps from happening, I recommend having an accountability partner. Do you have some one on your team who sees things very differently than you? Do they serve in a different role? A fresh set of ears and a different perspective can be a big asset in identifying potential shortcomings. They can help make sure that those tough questions are asked and fresh solutions are uncovered. A system of trusted accountability partners can help prevent the tunnel vision that happens when we get stuck in our habits and lose sight of those things we could be doing to expand our vision. Next, take the emotion out of it. I’m going to admit something to you that my entire staff would be shocked to hear, but I, Erik Barnlund am an emotional human being. Sometimes those emotions get the best of me. Especially when I get into a situation where I sense a difference of opinion, I sometimes communicate in a less effective manner. As I’ve matured as a leader, I’m getting better at realizing when I’m getting to that defensive and emotional state. I’ve discovered that what I need most is to put the problem on a shelf, take a deep breath and sleep on it. When I do that, I find I can approach the problem with a fresh mind. I can help support a lot better resolution and work more effectively with the person on the other end of the line. After all, it’s not whether you or the other person is right or wrong in a specific scenario. It’s whether you understand what’s ultimately and mutually right in the common ground that exists between your business vision and the mind of your customer.